Read that quote again as if you just read it for the first time. Here’s a few more questions to ask yourself: Do I plant seeds of self-judgement or negative thinking? Or do I plant seeds of love, gratitude, compassion and giving. Do I plant seeds of laughter, happiness and magnificence or weeds of catastrophic magnitude. By planting positive seeds we cultivate a garden of awareness. We water those seeds with love and kindness, yielding the fruit of our labors to our friends, family and those we associate with every day. In reality, when you plant a tomato seed, that’s want grows. If you plant seeds of love, you get love. How will your garden look next week, next month, next year? 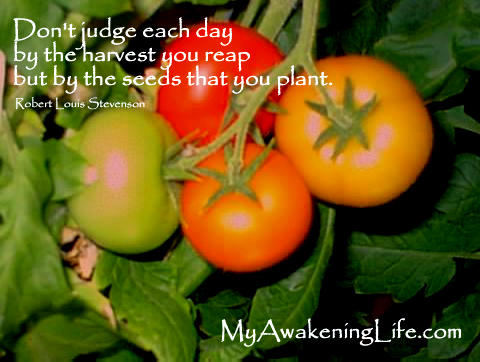 Visualize the seeds that you sow today and your garden of life will yield the blessed harvest. Bring this awareness into every moment of your day. I think it’s important to always look at the positive even when experience negative parts of life. It isn’t always easy and i don’t always succeed, but I do my best. Negative thoughts seem to multiply faster than positive, but positive grow stronger. Does that make sense?